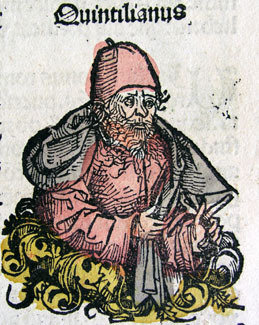 Roman rhetorician, born at Calagurris (Calahorra) in Spain. Concerning his family and his life but few facts remain. His father taught rhetoric, with no great success, at Rome, and Quintilian must have come there at an early age to reside, and must have there grown up to manhood. The years from 61 to 68 he spent in Spain, probably attached in some capacity to the retinue of the future emperor Galba, with whom he returned to the capital. For at least twenty years after the accession of Galba he was at the head of the foremost school of oratory in Rome, and may fairly be called the Isocrates of his time. He also gained some, but not a great, repute as a pleader in the courts. His greatest speech appears to have been a defense of the queen Berenice, on what charge is not known. He appears to have been wealthy for a professional man. Vespasian created for him a professorial chair of rhetoric, liberally endowed with public money, and from this time he was unquestionably, as Martial calls him, "the supreme controller of the restless youth." About the year 88 Quintilian retired from teaching and from pleading, to compose his great work on the training of the orator, the Institutio Oratoria. After two years retirement he was entrusted by Domitian with the education of two grand-nephews, whom he destined as successors to his throne. Quintilian gained the titular rank of consul, and probably died not long before the accession of Nerva (AD 96). A wife and two children died early. Such is the scanty record that remains of Quintilian's uneventful life. But it is possible to determine with some accuracy his relation to the literature and culture of his time, which he powerfully influenced. His career brings home to us the vast change which in a few generations had passed over Roman taste, feeling and society. In the days of Cicero rhetorical teaching had been entirely in the hands of the Greeks. The Greek language, too, was in the main the vehicle of instruction in rhetoric. The first attempt to open a Latin rhetorical school, in 94 BC, was crushed by authority, and not until the time of Caesar Augustus was there any professor of the art who had been born to the full privileges of a Roman citizen. The appointment of Quintilian as professor by the chief of the state marks the last stage in the emancipation of rhetorical teaching from the old Roman prejudices. During the hundred years or more which elapsed between the death of Cicero and the birth of Quintilian education all over the Roman Empire had spread enormously, and the education of the time found its end and climax in rhetoric. Mental culture was for the most part acquired, not for its own sake, but as a discipline to develop skill in speaking, the paramount qualification for a public career. Rome, Italy and the provinces alike resounded with rhetorical exercitations, which were promoted on all sides by professorships, first of Greek, later also of Latin rhetoric, endowed from municipal funds. The mock contests of the future orators roused a vast amount of popular interest. In Gaul, Spain and Africa these pursuits were carried on with even greater energy than at Rome. The seeds of the existing culture, such as it was, bore richer fruit on the fresh soil of the western provinces than in the exhausted lands of Italy and the East. While Quintilian lived, men born in Spain dominated the Latin schools and the Latin literature, and he died just too soon to see the first provincial, also of Spanish origin, ascend the imperial throne. As an orator, a teacher and an author, Quintilian set himself to stem the current of popular taste which found its expression in what we are wont to call silver Latin. In his youth the influence of the younger Seneca was dominant. But the chief teacher of Quintilian was a man of another type, one whom he ventures to class with the old orators of Rome. This was Domitius Afer, a rhetorician of N�mes, who rose to the consulship. Quintilian, however, owed more to the dead than to the living. His great model was Cicero, of whom he speaks at all times with unbounded eulogy, and whose faults he could scarce bring himself to mention; nor could he well tolerate to hear them mentioned by others. The reaction against the Ciceronian oratory which had begun in Cicero's own lifetime had acquired overwhelming strength after his death. Quintilian failed to check it, as another teacher of rhetoric, equally an admirer of Cicero, had failed -- the historian Livy. Seneca the Elder, a clear-sighted man who could see in Cicero much to praise, and was not blind to the faults of his own age, condemned the old style as lacking in power, while Tacitus, in his Dialogue on Orators, includes Cicero among the men of rude and "unkempt" antiquity. The great movement for the poetization of Latin prose which was begun by Sallust ran its course until it culminated in the monstrous style of Fronto. In the courts judges, juries and audiences alike demanded what was startling, quaint or epigrammatic, and the speakers practiced a thousand tricks to satisfy the demand. Oratory became above all things an art whose last thought was to conceal itself. It is not surprising that Quintilian's forensic efforts won for him no lasting reputation among his countrymen. The Institutio Oratoria is one long protest against the tastes of the age. Starting with the maxim of Cato the Censor that the orator is "the good man who is skilled in speaking", Quintilian takes his future orator at birth and shows how this goodness of character and skill in speaking may be best produced. No detail of training in infancy, boyhood or youth is too petty for his attention. The parts of the work which relate to general education are of great interest and importance. Quintilian postulates the widest culture; there is no form of knowledge from which something may not be extracted for his purpose; and he is fully alive to the importance of method in education. He ridicules the fashion of the day, which hurried over preliminary cultivation, and allowed men to grow grey while declaiming in the schools, where nature and reality were forgotten. Yet he develops all the technicalities of rhetoric with a fullness to which we find no parallel in ancient literature. Even in this portion of the work the illustrations are so apposite and the style so dignified and yet sweet that the modern reader, whose initial interest in rhetoric is of necessity faint, is carried along with much less fatigue than is necessary to master most parts of the rhetorical writings of Aristotle and Cicero. Quintilian's literary sympathies are extraordinarily wide. When obliged to condemn, as in the case of Seneca, he bestows generous and even extravagant praise on such merit as he can find. He can cordially admire even Sallust, the true fountainhead of the style which he combats, while he will not suffer Lucilius to lie under the aspersions of Horace. The passages in which Quintilian reviews the literature of Greece and Rome are justly celebrated. The judgments which he passes may be in many instances traditional, but, looking to all the circumstances of the time, it seems remarkable that there should then have lived at Rome a single man who could make them his own and give them expression. The form in which these judgments are rendered is admirable. The gentle justness of the sentiments is accompanied by a curious felicity of phrase. Who can forget "the immortal swiftness of Sallust", or "the milky richness of Livy", or how "Horace soars now and then, and is full of sweetness and grace, and in his varied forms and phrases is most fortunately bold"? Ancient literary criticism perhaps touched its highest point in the hands of Quintilian. To comprehensive sympathy and clear intellectual vision Quintilian added refined tenderness and freedom from self-assertion. Taking him all in all, we may say that his personality must have been the most attractive of his time -- more winning and at the same time more lofty than that of the younger Pliny, his pupil, into whom no small portion of the master's spirit, and even some tincture of the master's literary taste, was instilled. It does not surprise us to hear that Quintilian attributed any success he won as a pleader to his command of pathos, a quality in which his great guide Cicero excelled. In spite of some extravagances of phrase, Quintilian's lament (in his sixth book) for his girl-wife and his boy of great promise is the most pathetic of all the lamentations for bereavement in which Latin literature is so rich. In his precepts about early education Quintilian continually shows his shrinking from cruelty and oppression. Quintilian for the most part avoids passing opinions on the problems of philosophy, religion and politics. The professed philosopher he disliked almost as much as did Isocrates. He deemed that ethics formed the only valuable part of philosophy and that ethical teaching ought to be in the hands of the rhetoricians. In the divine government of the universe he seems to have had a more than ornamental faith, though he doubted the immortality of the soul. As to politics Quintilian, like others of his time, felt free to eulogize the great anti-Caesarean leaders of the dying republic, but only because the assumption was universal that the system they had championed was gone forever. But Quintilian did not trouble himself, as Statius did, to fling stones at the emperors Caligula and Nero, who had missed their deification. He makes no remark, laudatory or otherwise, on the government of any emperor before Domitian. No character figured more largely in the rhetorical controversies of the schools than the ideal despot, but no word ever betrayed a consciousness that the actual occupant of the Palatine might exemplify the theme. Quintilian has often been reproached with his flattery of Domitian. No doubt it was fulsome. But it is confined to two or three passages, not thrust continually upon the reader, as by Statius and Martial. To refuse the charge of Domitian's expected successors would have been perilous, and equally perilous would it have been to omit from the Institutio Oratoria all mention of the emperor. And there was at the time only one dialect in which a man of letters could speak who set any value on his personal safety. There was a choice between extinction and the writing of a few sentences in the loathsome court language, which might serve as an official test of loyalty. The Latin of Quintilian is not always free from the faults of style which he condemns in others. It also exhibits many of the usages and constructions which are characteristic of the silver Latin. But no writer of the decadence departs less widely from the best models of the late republican period. The language is on the whole clear and simple, and varied without resort to rhetorical devices and poetical conceits. Besides the Institutio Oratoria, there have come down to us under Quintilian's name 19 longer (edited by Lehnert, 1905) and 145 shorter (edited by Ritter, 1884) Declamationes, or school exercitations on themes like those in the Controversiae of Seneca the Elder. The longer pieces are certainly not Quintilian's. The shorter were probably published, if not by himself, at least from notes taken at his lessons. It is strange that they could ever have been supposed to belong to a later century; the style proclaims them to be of Quintilian's school and time.